Variations can happen in any job, and sometimes it can be a battle royal to justify what you’ve done to your clients. With Ensign’s electrical quantity surveying software, you can quickly and accurately calculate your variations and raise applications for payment, saving you and your business time and making it easier to get paid. The QS software seamlessly integrates with our Electrical Estimating Software and will save you time when setting up your projects by pulling through job and section values, and schedules of rates for you. 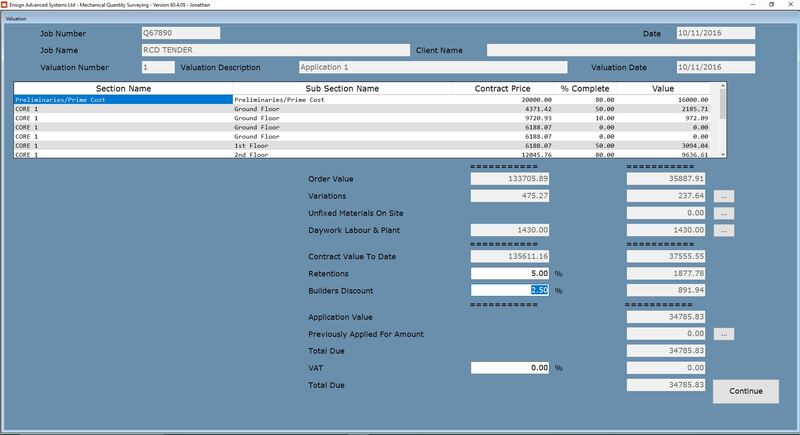 Take account of day-work, adds and omits, plant hire, star rate items, and more in seconds via our software, to produce accurate and comprehensive applications for payment which ensure you’ve accounted for everything you’ve done on the job, and give the client no reason to reject your payment requests. In conjunction with Ensign’s PDF TakeOff Software, you can measure variations directly on your drawings which can then be imported into the QS system for instant variation calculations and detailed reports. Not only that, but you can use the same PDFs as proof of any variations. With over 35 years’ experience, Ensign can make a substantial difference to your bottom line, and we provide bespoke set up of the software to fit your business needs, and comprehensive training and support from our highly qualified team, to make sure you get the full benefits of our software. We’re there to help you get paid on time, so why not give us a call today?